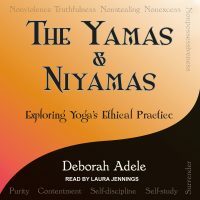 This is a very helpful resource as I begin to plan my first restorative yoga series, using the book to weave the yamas and niyamas into the practice. Are there other lesson plans to accompany the book? Many thanks. Lynn, I’m sure there are more resources, but I am not aware of them. Perhaps if you asked the question on your Facebook page and tagged me, you might get a response from others. I am inspired by you teaching the yamas & niyamas along with restorative poses; what a great idea!